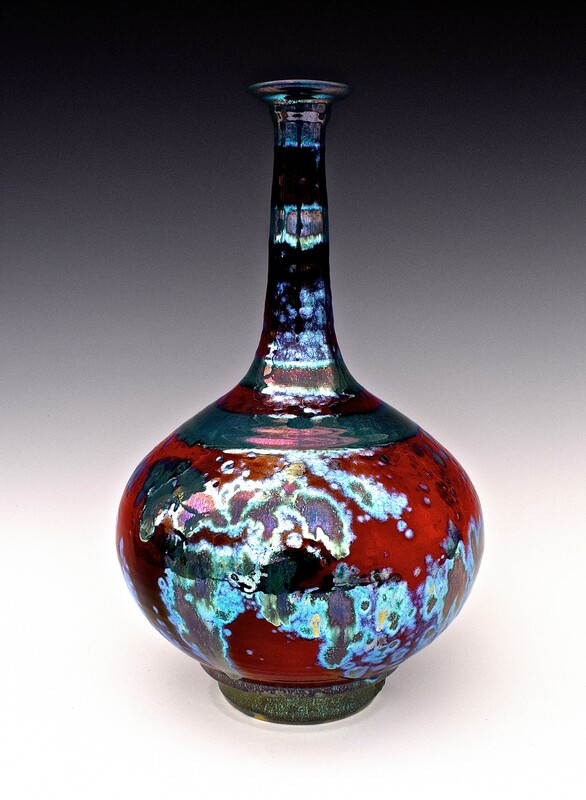 Born in Yorkshire in 1943, Sutton Taylor is one of Britain’s most renowned ceramicists. 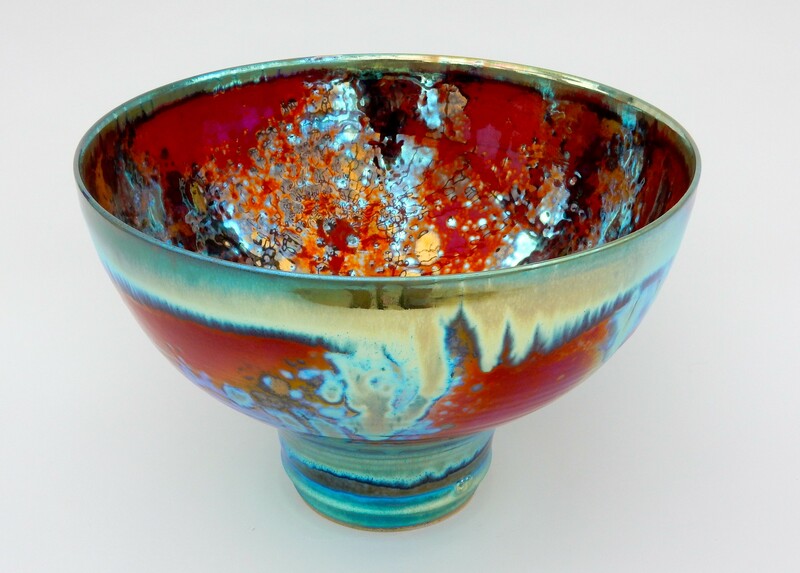 Despite originally training as a teacher, on his travels in Jamaica, Mexico and the USA he met several potters which inspired him to return to England and set up his first pottery in Yorkshire, where he began to work in stoneware and porcelain. 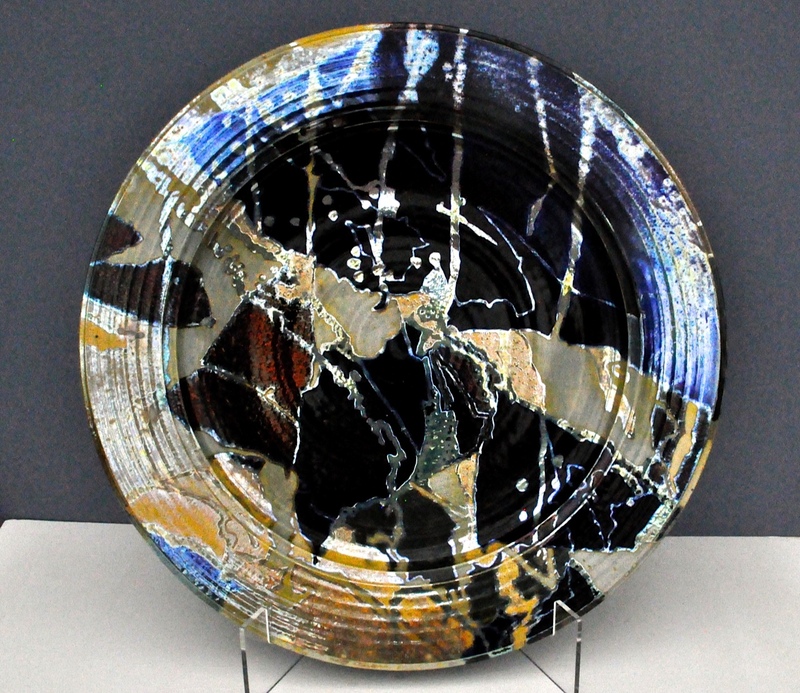 He also experimented widely with laminated clays. 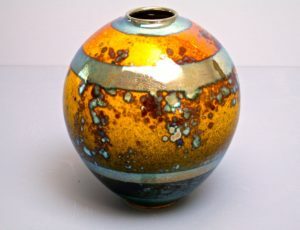 In 1974 he set up a wood fired kiln, with which he experimented in raku and using local clays, until eventually he came across the ancient art of lustre, which originated in 9th-century Mesopotamia and is known for its opulence and iridescence, and it became the focus of his subsequent career. 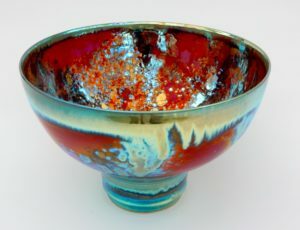 Having taught himself the notoriously difficult lustre technique, Sutton exhibited his first pieces of Lustreware in Leeds in 1976, and has continued experimenting with it ever since, even to the extent of making his own glazes, to produce one-off colours, combinations and textures. 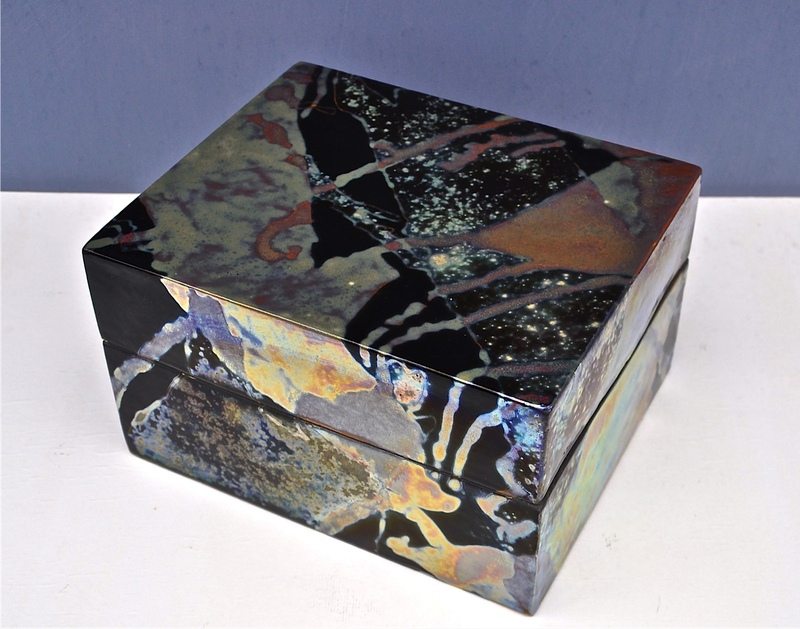 Lustre is extremely temperamental, particularly at the unusually high temperatures that Taylor uses to yield the effects he is seeking, and so his dazzling pieces are the result of years of experimentation, experience, instinct and intuition – particularly in the firing process. His work is represented in numerous public collections including the V&A Museum, Los Angeles County Museum, the Alhambra Museum in Spain, Melbourne Museum, Munich Museum, the Fitzwilliam Museum in Cambridge and the Ashmolean Museum in Oxford. 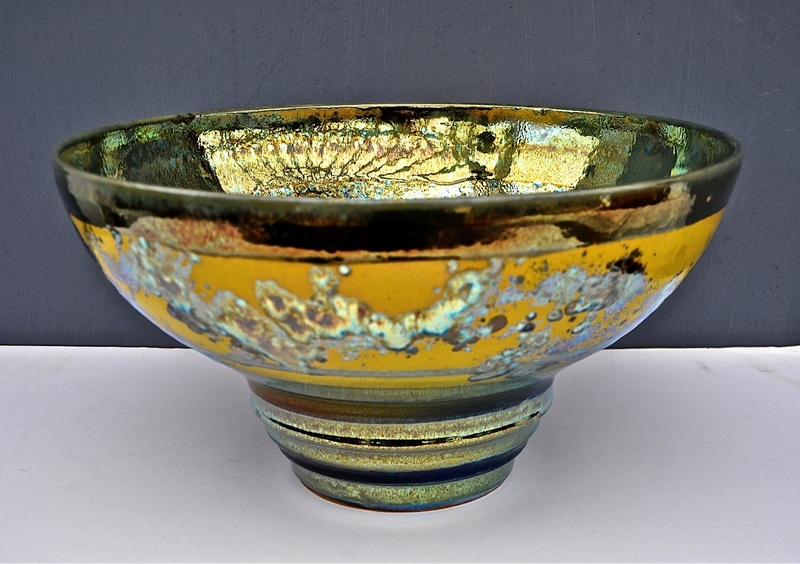 Since 1995 he has lived and worked in the far west of Cornwall, drawing on the forms and colours of the landscape for his inspiration. 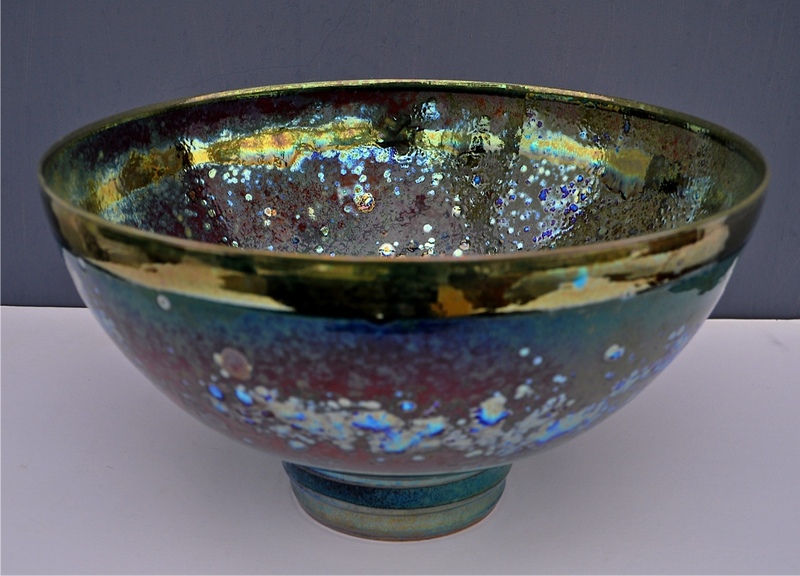 ‘What is Lustreware? 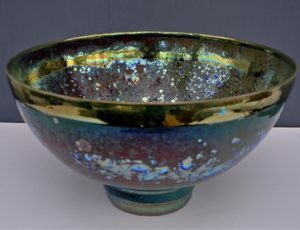 In the history of Ceramics Lustreware is defined as `an iridescent metallic surface used in the decoration of ceramics`. It is certainly that – but here it is rather more complicated. 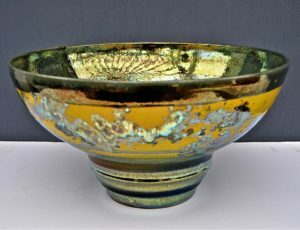 Historians believe that the technique of combining precious metals and ceramic glazes first emerged in ancient Egypt when glass – makers attempted to make glass vessels resemble solid metal vessels by coating the surfaces in gold or by incorporating gold into the glass. 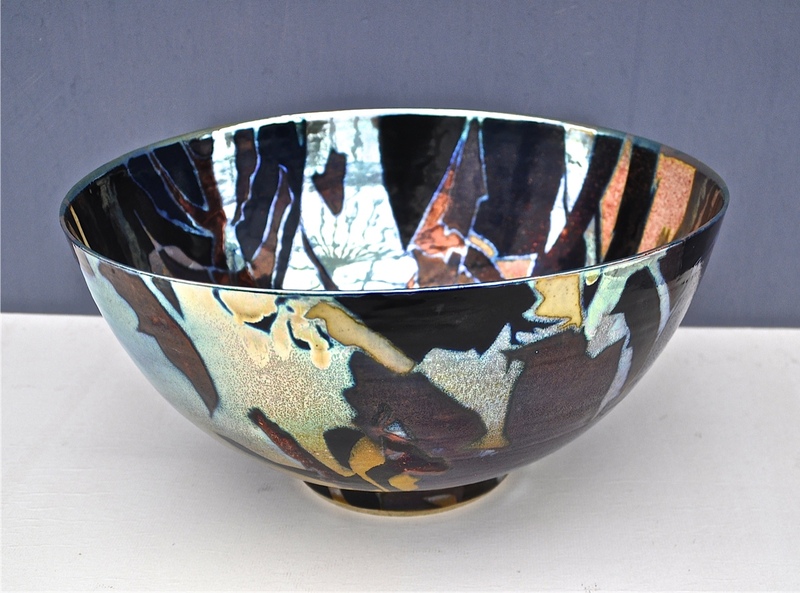 This may well be the case, for glazed pottery is coated in a film of glass. 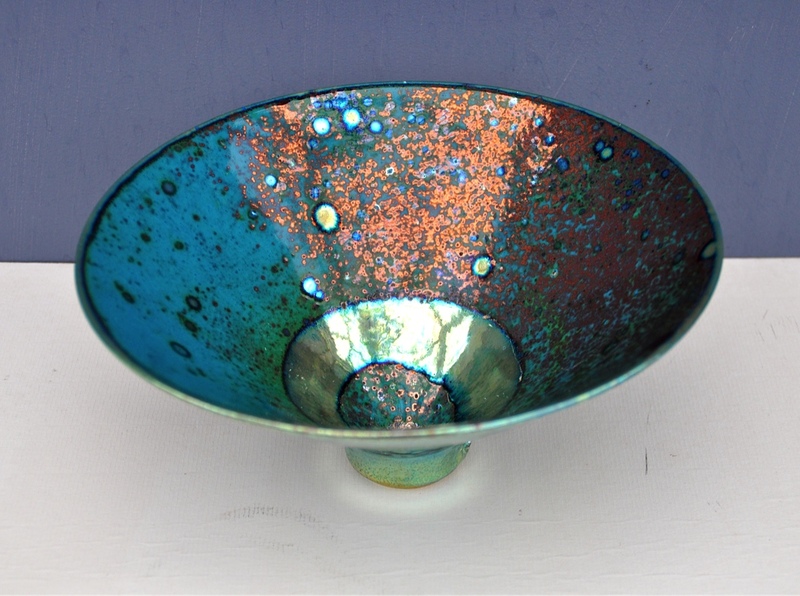 The word `lustre` derives from the latin `lustrare` – to illuminate – with connotations of being shining, splendid and brilliant. 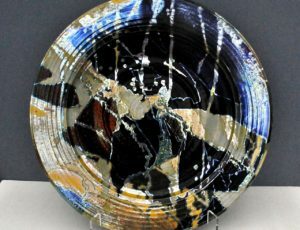 Throughout history potters have attempted to revive the technique and have often been brilliantly successful – but alas with breathtaking failure rates. Historical records are full of despair – eg: “only one in a hundred is good” – and consequently the successful pieces were highly prized and extremely costly. I think I do rather better than one in a hundred, but there is a significantly high failure rate. In the world today there are literally only a handful of potters working successfully in Lustre, although many try and abandon the attempt. Why is this? This is because the technique is capricious and infuriatingly difficult to pull off. Best results happen briefly before the point of destruction, moments before the glazes boil and blister, seconds before the metals volatile and disappear up the chimney and this golden moment must be detected whilst the gases in the kiln are oxygen free. This is made more difficult by the fact that this moment does not always occur at exactly the same temperature and if held too long the lustrous vanish. Too short a time is equally disastrous. 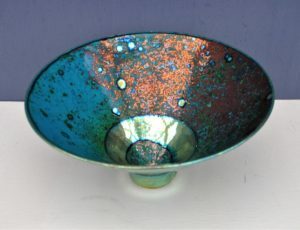 Humidity and general weather conditions affect it – so instinct has to be relied upon. 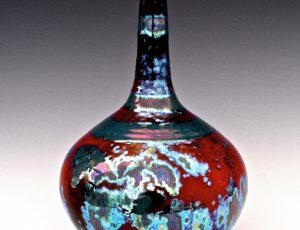 After close to forty years of experimentation I continue to be baffled and exasperated by the unpredictability of the technique. Why do I persist and continue to be frustrated by the complexities disappointments and high failure rate? It is because when it does work the colours are like no others and one day I will make a colour which has never been seen before’.